Facts about Anacharis plant. The Anacharis plant is commonly known as ”Brazilian Waterweed” It can survive in most of the water environments so it is treated as the idea aquatic plant for beginners (handling an aquarium for the first time). The perfect greenish appearance comes out when medium to high beam of light is focused on them. The Anacharis plant stems are slender and straight, mostly vertical. Stems are covered with straight, whorled leaves. The root fixes itself in the substrate of the aquarium. When the Anacharis plant grows up, it floats freely. Anacharis plant survives in both tropical and coldwater aquarium. Regular doses of fertilizer and moderate light are provided to the aquarium in case they are kept in a tropical one. The Anacharis plant can even survive in hard water if carbon dioxide fertilisation is supplied regularly. Anarachis function as nutrient controller and oxygen generator which in turn creates a healthy aquatic environment for the fishes. 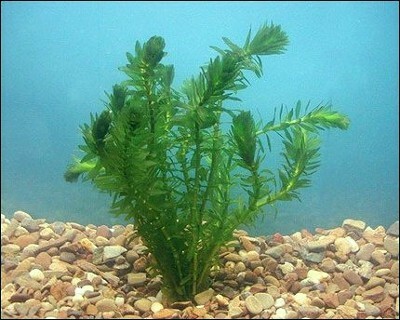 The Anacharis plant can be used in all kinds of freshwater aquariums. When abundant light is provided and the water temperature is suitable, the Anacharis plant undergoes a photosynthesis session with grater rate as long as such stimuli are available. As an end product of photosynthesis, oxygen is released which appear in bubbles all across the body of the plant. These oxygen bubbles make the Anacharis plant float; hence sometimes these plants float in the upper layers and sink otherwise. Anacharis plants live upon the excretory wastes released by the fish and also Carbon Dioxide, Nitrogenous wastes and phosphate wastes. With the Anacharis plant placed inside aquarium, one doesn’t have to replace the water and clean the substrate as frequently as without the plant. All one has to do is take care of the lighting system. A power of the bulb can be determined by calculating 2 watt per a gallon of water.